i'm going to be real. i get that it's a new year and i'm supposed to be highly motivated to become new and improved. but let's be real. it is the same old me. i'm totally fine with that. i don't make resolutions. i'm pretty content with my life and this version of myself. i'm also old enough to realize that 99.9% of the time resolutions don't stick. i'm realistic. there is no chance i'm going to overhaul my entire life this year. there is no chance that i'm going to become some totally different person who hates sugar and loves to go running. i'm not going to decide to give up my starbucks or caffeine in general. i'm not taking up yoga or fung shui. this is me. for better or worse. besides growing in wisdom and some more knowledge as this year goes by, i'm probably going to be a similar version of myself come january next year...and i'm completely fine with that. i am, however, quickly realizing that i have lived in the same house for the last eight years. eight years, people. that is the longest i have every lived anywhere besides my childhood home. before this stint in my current home, i moved every two years or so. moving is a pain but it also forces great purges of unneeded items, consolidation and organization. i'm sorry to say that my house needs a major "move" overhaul right about now. we are not going anywhere, however, so it is time for me to get motivated and reorganize on my own. i am completely unmotivated to do so but i can stand the clutter no longer. 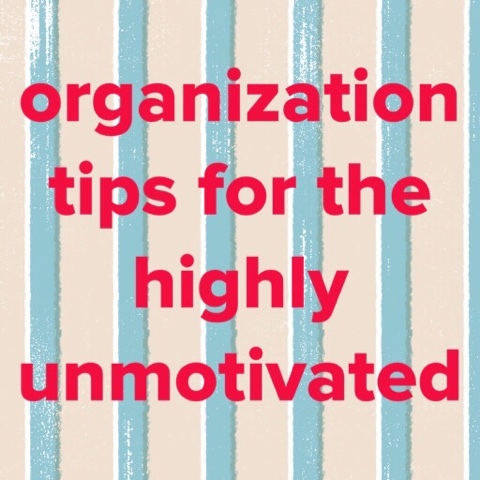 here are my tips for organizing when you have absolutely no desire to do so. 1) pick one room at a time. let's be honest. when i look at my house as a whole, it completely overwhelms me and i decide it is a better idea to go get a piece of chocolate and a cup of tea. that can no longer happen. if i focus on one room, however, it is somehow less daunting and more manageable to tackle. i don't care how much other rooms beacon, pick one room and stick with it. you will feel so much more accomplished when one room is complete than having one drawer organized in five different rooms. 2) do one drawer or one cabinet a day. i have five kids with homework, extra curricular activities, stomachs that need to be filled, and bodies that need to be clothed in relatively clean attire. i don't have a ton of free time. if i am realistic, an entire room will not get done in a day. one drawer, however, is probably do-able. i pick a drawer and go for it. at the end of the day, that is a huge win in my book. 3) if you can't do a drawer, pick five things. some days i can't even get to a drawer. my closet? forget about it. that closet is going to take me a month to get to (or more likely it will just sit in its current state for another year.) i may not be able to tackle a big closet or a pantry in one day but i can do five things. when i go in my closet, i find five things i can do without, five things i can give to salvation army or throw away. i can clear the clutter of five things and, even though it's a small something, it's something. i'm claiming small victories in this process. 4) if you haven't used it in the last year, pitch it. i was really good about doing this when i lived in south america. people with tremendous need were around me all the time and i felt extremely selfish keeping something that i maybe would use once over the course of a year when someone else could use it everyday. now when i'm not faced with poverty on a daily basis, i am quick to forget. i hold onto clothing and kitchen items that i really don't need. i read those tips about turning all the hangers backwards on new year's day and if you haven't turned them around by the next december, to get rid of them. i think that's a good idea but, really, are we that slow that we can't look at our clothes and know what we have used and what we have not? do we need that big of a reminder? i would go one step farther and say that if there isn't some kind of happy emotional attachment to an item of clothing or personal use, get rid of it. i'm sorry, but do we really need items of clothing or things in our house that we don't feel good in? do i really want to keep that pair of sweat pants that i always feel frumpy in simply because they are there? probably not. don't get me wrong, i'm keeping some of my comfy clothing. i'm just scaling back. there are people that could use a big sweatshirt a lot more than i can. in reality, i won't wear it but once or twice a season. that is not enough to keep it. same goes for household items. unless it is something that actually is useful or brings you joy, there is no need to keep it. that item you hold on to in case the person who gave it to you happens to come by in the next twelve months but that you secretly hate? life it too short. get rid of that thing! 5) share your accomplishments with someone who cares. this person is probably not my husband. my daughter and my fourth born, however, are perfect for this. i can open a drawer for them and my daughter will say without promting, "nice, mommy." i have trained her well. my fourth born will notice the drawer without being shown and will thank me for my hard work and for how nice it looks. that's just how he is. either way, i get some accolades for my work each day. that's all i really want when it's all said and done. i want to open a drawer and not cringe and then have one other person who notices and gives me a high five. there you have it. organization tips for #reallife people like me. don't get me wrong. there are days when i can't even manage one of those five. there are also days i manage to do five cabinets at one time. i figure it all balances out and my house is looking better and better each day. that is #winning at this whole new year thing in my book.